Las Terrenas. Luxury New Property for 12 people maximum. Full service. 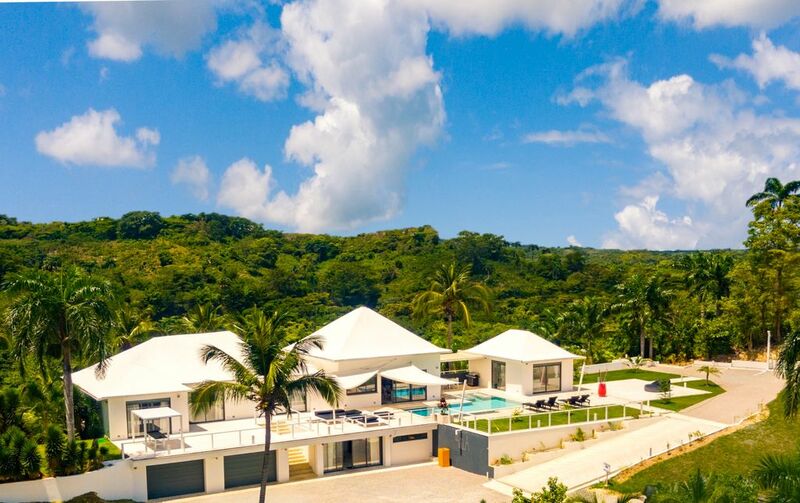 Ocean view and rear hill view, 5 bedrooms, + 2 extra bed, 5 bth, pool, jacuzzi. In all 5 bathrooms: wall mount makeup mirror, courtesy set, bathrobe, towels, bath towels. Smoke detector in each bedroom. and a catering service available. Car, motorbike or ATV recommended. I built this house because I love living in Las Terrenas. I am about to build others. An exceptional view of the sea and the hills behind. All linens and Pillows case. Towels, Bath Towels, Bathrobe, Courtesy set. The house was beautiful and as pictured but there were MANY issues experienced throughout our stay and I am not sure how they have not come up in previous reviews. 1) Multiple of the bathrooms (including master) had barely any water pressure. We were 9 girls and could barely wash our hair. The bath in the master took well over an hour to fill up. 2) The huge bath in the side house only came out COLD water. 3) The concierge burst into our house in the middle of the night after some of us had just taken a bath - luckily we had just put on our clothes. Apparently he was checking since the water was running so long (yes because there was NO a water pressure). It was COMPLETELY INAPPROPRIATE and downright scary for a random MAN to come in a house with 9 girls in the middle of the night. 4) No privacy in general with the staff. The security guard should be watching outside the house but instead was focused on looking at the girls in the pool until one of us said something. Maid literally took the entire day (at least 8 hours) to clean when we were having a pool day at the house. 5) House was not well stocked. There was no extra toilet paper anywhere in the house we had to continue asking for it throughout our stay. No kitchen basics such as salt / pepper / oil. 6) Worst of all when we told the owner about all of the issues above he seriously just shrugged and walked away. Did NOTHING to address them, fix the water pressure, water temperature, talk to his staff etc. 7) The last day out of no where the gas on one of the stoves started going off (continuous clicking noise and we could smell gas). Alain did NOTHING to help us, didn’t even come up to the house. Pierre was nowhere to be found (all of a sudden when we need him). We were frightened - gas going off in the house is scary !!! The security guard was trying to help but did not know how to fix it. Finally after over an hour Pierre showed up to turn off the gas at the tap. Overall we still did have an amazing trip, the house is beautiful and spacious with gorgeous views. Chef Daniel cooked us a nice meal (note if you want specific items you need to notify him a day in advance). We loved the outdoor areas and spent lots of time lounging by the pool. But, there were so many issues and it was really appalling that Alain the owner did nothing to address them. The house has many “for sale” signs up so maybe he just doesn’t care anymore. 3- At 9:15 pm (it’s not the middle of night) the concierge climbed to cut off the cold water that flowed for nothing, You can let cold water flow for days! there is nothing that will change .. so that you are not deprived of water…. 4- You are really full of contradictions. The Staff do not climb anymore, according to your instructions, but then you do not blame people for not climbing, if you forbid them. The maid is paying 5 hours a day, with the majority of customers it remains 4/5 hours, if she stayed more than 8h each time in the house, it's not for her own pleasure ... nor to bother you .... it's because the house we really needed….. I do not put ingredients voluntarily, given the number of different nationalities and different ways of eating, I would have to put four or five different oils four or five different vinegar or different mustard or mayonaise and ketchup. Previously I put the vinegar oil for the ingredients … etc (it was never the right thing or the right brand), I put 3 bottles of wine at check-in, beer, different soda, croissants every morning, But the villa was 600 dollars. With surveys the customers, they all prefer to have a price of $ 100 without this services. And it's not an all inclusive hotel, I just rent a villa. 6- I do not speak to my staff in front of customers. It went pretty well as long as I had to deal with your sister Nathalie, the 3sd day I met you, if I had met you the first day, I would have paid you back and put out of the villa, because if you think you can come to my house, play the cheap superstar,To say hello with arrogance, look up at me with contempt, Ban my staff from go up to the villa and that I have to respect you .You are wrong heavily !!! The villa is not for sale, the signs are for neighboring land, ))) While 35 years, I rarely have to attend a dirty check-out, rarely have I been left with a house in this state, with very little Dignity, blood on the mattresses, hygienic diapers on the floor, not even ashamed !!! You can play the superstar!!! Fortunately I have people like you, every 500 check-in. Amazing home, host and staff! My business partners and I loved every minute of our stay, our host Alain and Maicol were amazing! Nous étions 6 enfants, 6 adultes. Immense maison, très propre, au delà de nos attentes. Grande gentillesse du personnel. Sentiment de sécurité. Plage à 10 minutes de marche rapide, 30 minutes avec les enfants! Nous avons loué des quad, fort utile. Propriétaire présent, a l'écoute de nos besoins. I just returned from a 5 night stay at this beautiful property. We absolutely loved this property. We used the chef Daniel’s services on the day we arrived for lunch and breakfast the next morning. We were a group of 4 & we definitely felt that it was overpriced for the groceries. We gave him $80(4,024 pesos) for groceries which in DR is a lot. Daniel said he would provide us a receipt and he did he spent $3200 pesos on “food & ingredients” to cook and he said the remaining $800 would be used on salami & cheese that he didn’t get a chance to get while shopping. (FYI we went to the same supermarket 2days later & spent $300 pesos on the same salami & cheese. On top of the fact he “bought expensive” groceries he actually had the nerve & took the ingredients back with him & didn’t leave it in our kitchen. For example we needed oil & we couldn’t find it in the house. I had to call Pierre & he didn't bring it back until we insisted that we needed it since they bought it with OUR money. He literally told me I didn’t need the oil since there was a pan of used oil in the oven from the previous day he made us breakfast. Although I initially thought having a chef for a $100 was a great bargain, nowhere did it state we would have to buy our own groceries as well fight to keep them after we’ve paid. We literally paid $180 for a lunch and breakfast for 4 people. And didn’t have anything left over in the fridge. That’s pretty ridiculous if you ask me. The lady that cleaned the villa was very great. She was very nice & personable & always made sure the villa was tidy before we came back. The younger boy Michael was also helpful whenever we needed a quick errand done he was always available. He made sure our pool was cleans along with the grounds. Aside from the little mishaps we enjoyed our stay in this villa, Pierre the concierge we met him & then barely ever even saw him. Unfortunately he was injured with his leg. I was expecting having a concierge in our villa he would be checking in on us every day asking if there is any tours or information we needed for the day. That didn’t happen. In fact the only time he came voluntarily was to finally check on us until check out just so he can make sure we didn't break anything. if you are considering booking this villa I recommend renting a car. This villa isn’t close to anything & taxis charge $30 each way. Also buy your own grocery prior to arrival. That way if you want a chef you can just pay the service. are recommendations, they are not part of the staff of the Villa. You are absolutely free to use the services of other cook, or other service providers at the villa. I do not understand why, as you saw me every day, you did not talk to me, if you had a problem with the chef. with praises for Chef Daniel services. we can not serve the same thing to a person from the depths of China and a Frenchman from Lyon or an Italian from Milan….. The first night, you were 7 persons not 4. Therefore, the next morning, the chef prepared the meals for 7 persons as no one had advise him that there would only be 4 persons. The meeting at check-in serves to communicate that kind of information. - Beef filet Dijonnaise, (mustard sauce, imported) for your information: this sauce is for meat and not for salad. You have taken the 2 main courses and eat them all … plus cheese, plus a birthday cake for 10 persons. You paid US$80 purchase of food and US$80 for his work. For some people, it may seem too expensive, I can understand. You should know that everything is imported this is why in Las Terrenas food is between 15/20% more expensive than Santa Domingo. At La Villa, the price of meals is always between 8 and 12 dollars, service included. This price seems very reasonable to me for a meal in Las Terrenas. Had the pleasure of staying at this beautiful property over our Thanksgiving holiday. The owner, Alain, is wonderful and very accommodating. Our flight home wasn’t until 8pm and check out is at 11am. He called me to tell me that we can check out anytime. I thought that was so kind and generous of him to offer. We really weren’t sure what we were going to do for all of those hours. Pierre is their 24 hour concierge. He’s so friendly and helpful. Janet comes each day to wash dishes and clean rooms. There are also others who come to the house each day, to fix landscaping and clean the pool and various other things. Overall, this was a great pick. Alain is also very responsive. Any questions or concerns I had before arriving, he answered very promptly. The waterfalls of El Limon horseback. The Coffee Route in ATV Qwad (adventure racing) very nice.